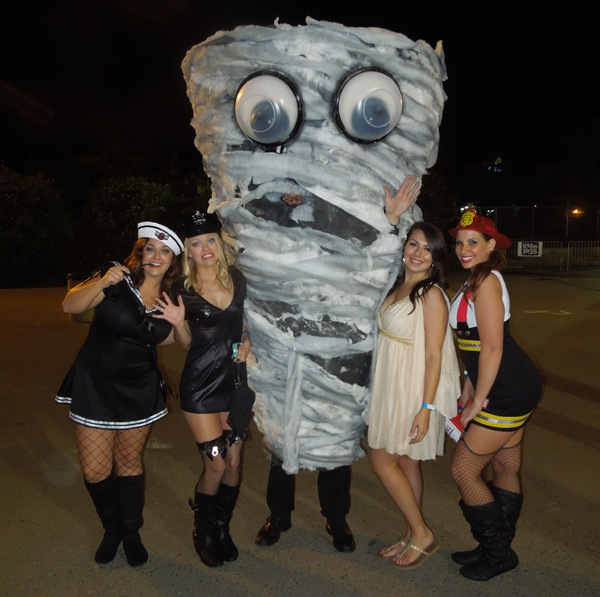 It was difficult to get the Tornado costume on and off, so I didn't drink. It turns out that there is a direct correlation between how much you drink and how much you have to pee. 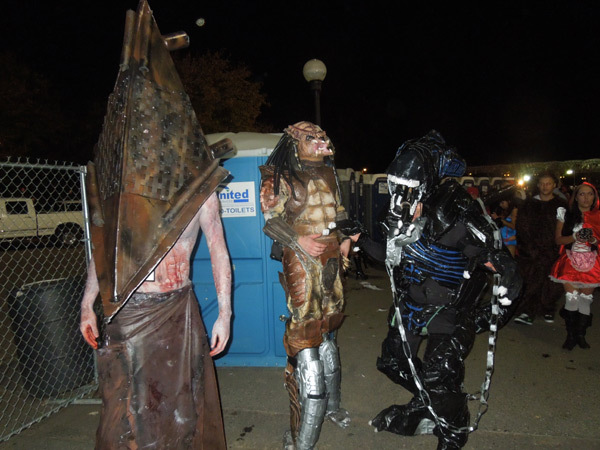 On my one bathroom break, I spotted these three, a duct tape alien, a duct tape Predator and an excellent triangle head costume. They also had finalist lanyards. Inside, time was slooooowly passing. I was having an easier time reaching people via text than I was connecting with people at the party. Francois' group began setting up the parts to his Transformer costume. 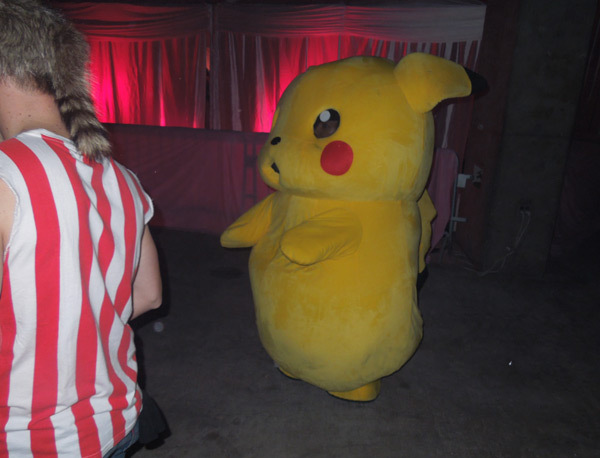 As midnight approached, the other finalists arrived at the side of the stage, queueing for the costume contest. Francois' Transformer looked great, and this perfect Picachu was an adorable bundle of competition. Waiting for the contest to start, Optimus Prime got the lion's share of attention. I'm sorry that I didn't get a better photograph. 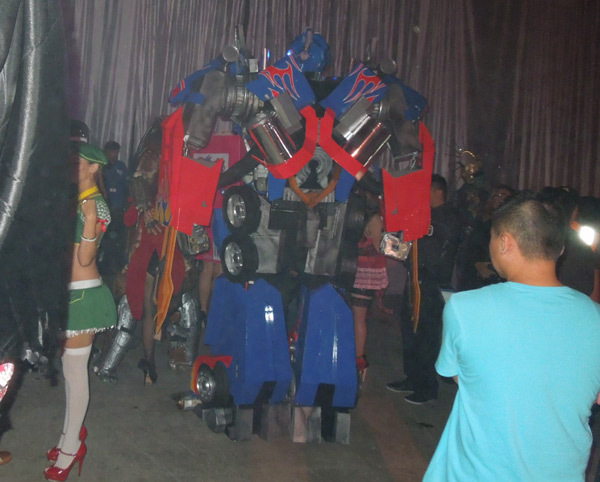 Optimus Prime was an extraordinarily detailed costume, probably 12 feet tall, with two giant swords. I couldn't beat him. The crowd roared for my enthusiastic spinning, but the Transformer ruled the day. Optimus Prime won! After the contest, half-naked angels helped me offstage and into the VIP area. I had a pretty good run of feedback, including "your costume was my favorite", and "How did you make it spin?!" I was disappointed in the loss, but relieved that I didn't lose to a trio of Cosby kids or to Cheech and Chong. On the way out of the party, I got a few more photos, including this one. Ignoring these comely lasses for a moment, note how my costume was thrashed. the tornado had a weird frown! Had it been thrashed onstage during the contest? I had no idea. The big money was gone, but there were a few more contests to enter before Halloween was over.